Stina Wassén graduated from the University of St Andrews with a bachelor’s degree in International Relations in 2015 and completed an MSc in International Migration and Public Policy at the London School of Economics in 2016. During her university studies, Stina focused on international relations theory, international security, migration and mobility and EU law and politics. She now works as an analyst at the corporate intelligence firm Kroll in London. This dissertation studies how securitisation processes may become institutionalised by examining how the securitisation of illegal immigration at the EU level trickled down and became internalised by the Swedish government and police post-2001. Utilising discourse analysis, it investigates how the Swedish government and police spoke about REVA and the ICFs to show how the two institutions internalised the securitisation of illegal immigration. By applying a sociological understanding of Securitisation Theory, whereby not only speech acts but also contexts and bureaucratic developments are considered, it demonstrates how processes of securitisation can unfold also when securitising speech acts seem hidden. From the end of 2012 until mid-2014, Sweden witnessed an intense public debate regarding REVA and an increase of internal controls of foreigners (ICFs) carried out by the police. As gradually became known, REVA (“Rättssäkert och Effektivt Verkställighetsarbete”), meaning ‘Legally Secure and Efficient Enforcement’ was a government initiated project lasting between 2008 and 2014, which sought to increase the number of executed deportations of illegal immigrants from Sweden (Justitiedepartementet 2008b, p.5). Through the discussion about REVA, it became know that the great increase in ICFs was a result of Sweden operationalising the Schengen Agreement in 2001, as well as a result of a governmental aim to increasing the number of deportations through REVA. After REVA became known to the public, journalists and citizens wrote articles and organised protests condemning a seemingly new and intensified governmental focus on finding and deporting illegal immigrants (Heberlein 2013; Lindell 2013; Stark 2012; Åberg 2013). Interestingly, as the government and police began to defend REVA and the ICFs, it became evident that neither institution understood why REVA and the ICFs resulted intense resistance. Looking at REVA and the ICFs through the lens of securitisation theory (ST), interesting questions arise. The intensified focus from the government to increase the number of deportations of illegal immigrants clearly points to a securitisation of illegal immigration in Sweden. Still, the lack of securitising speech acts on behalf of the government and the police, depicting illegal immigration as a security threat and REVA as the solution to this threat, calls into question a strictly speech act approach to securitisation (Wæver 1995). Still, as the founding figures of ST themselves put it, even when the language of security is absent, the process of securitisation may still be taking place (Buzan et al., 1998). In such instances, the threatening character of an issue has become so taken for granted that securitising actors no longer have to justify why an issue poses a threat–the securitisation has become institutionalised (ibid). As many scholars have already demonstrated, immigration has not always been seen as a potent security issue within the European Union (EU) (Boswell 2003; Huysmans 2000; van Muster 2009). Equally, before the 1980s, collaboration on the issue of immigration between EU member states was primarily orchestrated via the United Nations and the Council of Europe, and not through EU institutions (van Muster 2009, p.2; Lavenex 2001). However, as European integration increasingly became understood as a key issue for economic and political stability in the 1980s and 1990s, various platforms within the EU–not least the Schengen Agreement–began to link the topic of immigration to that of terrorism, trafficking and other illegal activity (van Muster 2009; Boswell 2003; Bigo 2002; Bounfino 2004; Mitsilegas et al., 2003). Over the past three decades, immigration has, as Ulrich Beck put it, increasingly become the scapegoat for all the current ills of society (1992, p.75). Truly, the Schengen Agreement has played a crucial role in this securitisation of immigration at the EU level (van Muster 2009; Mitsilegas et al., 2003). As borders within Schengen have been removed, pressure has risen on member states to implement so-called compensatory measures (CM), such as ICFs, in order to counter illegal stay and entry in and to the Schengen area (Boswell 2003; Ette & Fais 2007). Against this backdrop of a preceding securitisation of illegal immigration on the EU level, the article will investigate how this securitisation process has trickled down to the national level of Sweden, and how it has become institutionalised by the Swedish government and police. Because REVA and the ICFs were not preceded by any justification on behalf of the government or the police, and only became a topic of political debate after the media and the public became aware of them, the case study of Sweden serves a particularly valuable example with which to investigate the concept of institutionalisation within ST. By examining the increase in ICFs in Sweden post-2001, and the emergence of REVA in 2009, the article asks – Where Does Securitisation Begin? The aim of this article is to examine how the securitisation of illegal immigration has become institutionalised in Sweden through the ICFs and REVA. In doing so, the article will expand on and further develop the existing ST, as well as the current literature regarding the securitisation of immigration. Secondly, by looking specifically at the case study of Sweden, the article will examine how the institutionalisation of a securitisation processes may materialize through bureaucratic and institutional developments, where the threat image is implicit. This specific case study will also illuminate how securitisation processes may not only include one actor-audience relationship, but rather, that multiple relationships–where actors and audiences may change place–can exist. Subsequently, the article will contribute to the existing, albeit underdeveloped, literature on institutionalisation within ST. In order to explore how the Swedish government and police have institutionalised the securitisation of illegal immigration through REVA and the ICFs, this article will use discourse analysis (DA). Whilst acknowledging the existence of multiple classifications of discourse (Jorgensen & Phillips 2002, p.9; Hansen 2011), the definition utilised here regards discourse as: a series of written or spoken utterances that intersect over a specific topic, policy, identity or alike, and which frames that ‘issue’ in a certain way, and which also limits the possible responses to the ‘issue’ described. Building on this definition, the usefulness of adopting DA for this particular investigation lies in the ability of DA to highlight what dominant discourses exist and how they serve to create structures of power and meaning. Indeed, as Hansen (2006) notes, discourses not only define identities, but also ultimately construct them in relation to one another, creating power structures where some are empowered and others constrained, and where the ability to speak is unevenly distributed. In addition, adopting DA is useful as it helps us to expose the efforts made to make certain discourses and meanings internalised and taken for granted (Milliken 1999). As will be demonstrated in this article, whilst discourses and the meaning of words constantly change, discourse as the representation of things, when reproduced over and over again, may become institutionalised and taken for granted (Neumann 2008, p.61). The ability of DA to go behind and deconstruct ‘apparent’ meanings of things and to investigate the underlying structures and power dynamics at play (van Dijk 2000) is why it proves particularly useful for this article. A note on selection: to examine the government’s discourse surrounding REVA and the ICFs, a keyword search was conducted using www.google.se in order to study where and how the Swedish government had mentioned and/or discussed REVA and/or the ICFs. In so doing, four main types of texts were located. Firstly, the appropriation directions regarding REVA, issued between 2008 and 2013 from the government to the police, were analysed in order to examine how the government has spoken about the need to increase the amount of deportations of illegal immigrants. Secondly, parliamentary debates that discussed REVA and/or the ICFs were examined in order to show how the government had spoken about the need for REVA and the ICFs. Thirdly, a close study of the governmental report from 2004 discussing border controls in Sweden was analysed in order to observe how the government’s views on illegal immigration had become influenced by Sweden’s membership in Schengen. In total, 10 texts where selected for the purpose of examining how the government has spoken about REVA and the ICFs. In order to also examine the official view held by the police regarding REVA and the ICFs, a keyword search was again conducted using www.google.se in order to locate where and how the police had mentioned and/or discussed REVA and/or the ICFs. In so doing, two main types of texts were identified. Both official statements publicised on various local police organisations’ web sites, and two official reports by the National Police Board were analysed in order to study the official view held by the police regarding REVA and the ICFs. In total, 9 texts where selected for the purpose of examining how the police spoke in regards to REVA and the ICFs. Clearly, the list of texts analysed in section 4 is by no means exhaustive and for a larger study a bigger pool of texts would have been included. However, due to the limited scope of this article, the above mentioned texts were chosen as they arguably best display the official view held by the government and the police towards REVA and the ICFs. This article is divided into five sections. Section 1 provides an overview of the original formulation of ST and explores how the concepts of macrosecuritisation and institutionalisation have so far been articulated within ST. Section 2 engages with two of the key shortcomings of the original formulation of ST, that of the Actor–Audience Relationship, and that of the role of Contexts and Moves within ST. By engaging with the notion of securitising practises, the section also seeks to reignite the concept of institutionalised securitisation in order to develop a more readily available tool when looking at how institutionalisation works empirically. Section 3 introduces the case study of Sweden and looks closer at how the securitisation of illegal immigration has become institutionalised through REVA and the ICFs. By utilising DA of how the government and the police have spoken about REVA and the ICFs, section 4 examines how the two actors have internalised the securitisation of illegal immigration. In section 5, it will be argued that the securitisation of illegal immigration at the EU level has trickled down to the national level of Sweden, resulting in an institutionalised securitisation of illegal immigration by the Swedish government and the police. The ST was originally articulated by the CS; a group of scholars from diverse theoretical backgrounds who came together to developed a new approach to security studies. As stated at the onset of the defining work of ST, Security: a new framework for analysis (Buzan et al., 1998), the traditionalists’ conceptualisation of security, which focuses merely on military issues and state security, was too narrow. The CS’s development of ST should be seen as a response to the calls for a ‘widening and deepening’ of the traditional security agenda (Nye & Lynn-Jones 1988; Buzan 2009; Wæver 1995, Farrell 2002). The initial formulation of ST draws heavily on constructivism, which becomes apparent through its notion of security issues as socially constructed as well as its key focus on language as performative and self-referential (Wæver 1995). ST seeks to move beyond the traditional focus on state and military security and instead “explore the logic of security itself to find out what differentiates security and the process of securitisation from that which is merely political” (Buzan et al., 1998, p.4-5). As such, ST refutes the realist argument that pre-existing threats can be readily located ‘out there.’ Instead, the CS’s aim is to incorporate constructivist thinking in order to understand how, by whom and under what circumstances an issue is constructed as a security threat (ibid). The CS contends that security issues are socially constructed. More specifically, by drawing on the work of John L. Austin (1962) and John R. Searle (1969), the CS proclaims that security is a speech act (Buzan et al., 1998). According to the CS, uttering security does more than simply describe a pre-existing threat (Williams 2003; Ciutå 2009). As Ole Wæver puts it: “the utterance itself is the act” (1995, p.55 original emphasis). Saying ‘I do’ at a wedding, or naming a child at a baptism, are assertions that not only describe a pre-existing materiality, but also serve to create “social reality for issues” (Stritzel 2014, p.20). Consequently, in a securitisation process, speech acts work to depict issues as “posing an existential threat to a designated referent object” (Buzan et al., 1998, p.21). In so doing, a speech act moves an issue out of the realm of normal politics and legitimises the use of emergency measures to deal with it (ibid). The CS elaborates that what is meant by existential threat and emergency measures depends on the realm or sector in which the designated referent object exists. In short, the uttering of the word ‘security’ is the securitising move that seeks to take an issue “beyond the established rules of the game and frames the issue either as a special kind of politics or as above politics” (ibid, p.23). However, for a securitisation to be rendered successful, a securitising move does not suffice on its own. As the CS makes evident, an issue is only successfully securitised “if and when the audience accepts it as such” (Buzan et al., 1998, p.25). Against the backdrop that Ole Wæver already in his earlier work formulated security as a speech act (Wæver 1995), we can see how the CS’s conceptualisation of securitisation, as in need of audience acceptance, seeks to combine the notion of language as ‘self-referential’ with the idea of security as an intersubjective practise. For the CS, the securitising actor and the audience together negotiate the construction of security (Buzan et al., 1998). As a continuation of the argument that securitisation is an intersubjective practise, the CS describes three main ‘facilitation conditions’ that aid the successfulness of a securitisation process (Buzan and Wæver 2003, p.72). The first facilitating condition is that which refers to the internal grammar of the speech act. This means that a speech act has to construct a threat in such a way that it makes sense to the audience in relation to pre-existing logics of security. More specifically, the speech act must create “a plot that includes existential threat, point of no return, and a positive way out” (Buzan et al., 1998, p.33). The second facilitating condition declared by the CS, refers to external conditions regarding the actor speaking security. Certainly, not every actor is equally able to activate successful securitising processes and the CS emphasises that actors in a relative position of authority will have a greater chance for making a speech act work (ibid). The third, and final facilitation condition has to do with the threat itself. Arguably, if attributes of a perceived threat can be linked to issues that already are regarded as threatening, this can serve to aid a new process of securitisation (ibid). Traditionally, the CS has been mainly interested in processes of securitisation taking place at the so-called ‘middle level’ of world politics where “collective political units”, usually states, create friendly or hostile links to each other (Buzan & Wæver 2009, p.253). The argument behind this focus has been that it is the middle level that provides the most activity, and also, that it proves difficult to find audiences at the individual and/or system level of world politics (ibid). The concept of macrosecuritisation then, has been developed in order to “broaden the scope and temporality of a speech act” and to study “the procedural dynamics entailed at different stages of a securitisation process” (Donnelly 2013, p.47). More specifically, macrosecuritisation refers to the ways in which over-arching securitisation processes structure various lower-level securitisations and/or ties them together (Buzan & Hansen 2009; Buzan 2006). One such example has been the Cold War, which for decades served to influence multiple lower-lever securitisation processes (Buzan & Wæver 2009). As Buzan (2006) noted, the Global War on Terror can also be regarded as a successful macrosecuritisation. As with any securitisation, macrosecuritisations require actors, speech acts and accepting audiences (Buzan & Wæver 2009, p.265). The CS contend that in order for a macrosecuritisation to be successful, the securitising actor is most likely a major international power and/or institution. Additionally, successful macrosecuritisations depend on the construction of a higher-level referent object, able to mobilise “the identity politics of a range of actors within [a] system” (ibid, p.268). The strength of this concept is its ability to highlight how securitisation processes never stand on their own but that they often contain several interlinked layers and parallel developments. Further, this umbrella-type securitisation opens up for the existence of multiple audiences across different layers and units and it provides the tools for investigating how different layers and processes interlink (ibid, p.275). In addition to macrosecuritisation, institutionalisation is another feature of ST by which the CS aims to expand the scope and temporality of speech acts. Indeed, whilst the CS argues that by saying security, something is done (Wæver 1995, p.55), they do not argue that a speech act is defined solely by the utterance of the word security (Buzan et al. 1998, p.27). Patently, there are cases when the word security is used without securitisation taking place as well as instances that operate according to the logic of securitisation without the direct use of the word security (ibid). The CS asserts that processes of securitisation can become institutionalised, whereby the threatening character of an issue has become so internalised that actors no longer have to convince an audience that something is a security threat (ibid). Put differently, institutionalised securitisation makes itself evident when the need for elaborate rhetoric describing the threatening nature of an issue has become surplus. As the CS contends, when securitisation has become institutionalised, “constant drama does not have to be present, because it is implicitly assumed that when we talk of this […], we are by definition in the area of urgency” (Buzan et al. 1998, p.27 original emphasis). One such example of a securitisation that has become institutionalised is the securitisation of HIV/AIDS (Elbe 2006). In addition, institutionalised securitisation also includes developments whereby already securitised words eventually become so taken for granted that an actor only has to utter that word in order to move new issues into the space of emergency without detailed arguments regarding the threatening character of them. Terrorism is one such word that, when linked to other issues, for example religious fundamentalism, instantaneously securitise them (Buzan & Wæver 2009, p.267). Interestingly, Didier Bigo’s (2000) idea of ‘security continuum’ also seeks to address how fear for one securitised concept may affect people’s feelings towards other issues. For example, crime, unemployment, drugs, terrorism, and migration are often merged together in institutional documents, aiding a general but never justified fear for all phenomena equally. Indeed, the idea of “security continuum” links well to the concept of institutional securitisation in so far as it serves to show how already securitised words such as ‘terrorism’ has been used in such a way as to aid the securitisation of other phenomena, such as migration. An additional way in which the concept of institutionalised securitisation is used is to refer to the ways in which institutional and bureaucratic procedures may be created in order to deal with a threat that is seen as persistent and/or recurrent (Buzan et al., 1998). As Marco Antonio Vieira has pointed out, an issue has become institutionalised “only if the threat (either perceived or real) is resilient enough to demand the build-up of standing bureaucracies and procedures” (2007, p.140). After having briefly covered the CS’s original formulation of ST we now move on to investigate its shortcomings. The CS’s formulation of ST has received multiple and constantly evolving criticisms from a vast array of scholars. This massive collection of reviews has formed what is now spoken of as the ‘second generation’ within ST. The next section will first engage with existing criticism of the CS and thereafter advance beyond the current debate in order to improve the concept of institutional securitisation. The central claim of the CS is that (in)security is intersubjectively constructed in a dialectic process within which both actor and audience are key. Whilst securitising actors provide securitising moves, audience acceptance is crucial for the success of any securitisation process (Buzan et al., 1998). Despite the centrality of this relationship for the CS however, it has been left largely under-theorised. As Myriam Dunn Cavelty notes, whilst the CS argues that the success of a securitising move is dependent on the acceptance by an audience, “it remains largely unclear what audience must accept what argument and for how long” (2008, p. 26). Following this uncertainty, several scholars have sought to demonstrate that both actor and audience within a securitisation process constantly vary. For instance, Bigo (2000) and the C.A.S.E Collective (2006) have revealed how not only political elites but also special agencies may occupy the role of securitising actors. In a similar vein, by examining how securitisation processes may work in non-democratic contexts, Juha Vuori (2008) has shown how the audience may vary between power elites, the military, or a group of fundamentalists (ibid, p.72). Importantly, Vuori contends that it does not make sense to try and allocate a constant audience within ST, as both audience and actor are context dependent (ibid, p.72). Apart from identifying the existence of multiple kinds of actors and audiences, scholars have also shown how securitising actors may target multiple audiences at the same time (Balzacq 2005; Roe 2008; Vuori, 2008). In addition, Michael Williams (2011) has stressed how, in a securitisation process, an audience is not a passive category. Rather, securitisation takes place in a dialectic process between actors and audiences. As Paul Roe has made evident, through examining the UK’s decision to invade Iraq in 2003, it is greatly misleading to perceive an audience as one single coherent actor. To the contrary, Roe’s work points to how one securitisation process may contain multiple audiences and that the links between audiences and actors are multifaceted and complex (2008). In addition, after having been inspired by Balzacq’s notion of moral and formal kinds of support (2005, p.184-185), Roe argues that not only may a securitisation actor need the support from different audiences; securitisation is a patent two-stage process. This process includes one “stage of identification”, wherein a securitising move is made, and one “stage of mobilisation” where necessary responses to the perceived threat are developed (ibid, p.620). In short, not only does an audience provide different kinds of support, there are also differences as to what an audience is asked to concur with, i.e. “this is a threat” and/ or “given that this is a threat, this is what I propose we do about it” (ibid, p.622). In addition to this claim presented by Roe, it is of importance that we do not perceive of audience acceptance as a zero sum game. Truly, a securitisation move can be accepted by some part of an audience whilst simultaneously be rejected by another. What is important then, is that an actor receives the support (formal or informal) of enough of the audience–“the critical mass” (Vultee 2011, p.83) – in order to legitimise the use of extraordinary measures to deal with it. As the authors above have shown, we must constantly ‘look and see’ (Wittgenstein 1958; Donnelly 2013), in each case of securitisation who the actors and audiences are and what role they play in the process of constructing a threat, as well as legitimising the measures suggested or used to deal with it. In addition, we must acknowledge that processes of securitisation take place among entities where power is not evenly distributed and that this affects actors’ and audiences’ ability to make or accept a securitising move (Vuori 2008). Just like Hansen has argued that some individuals are less able than others to speak security (2000), the question should also be asked regarding audiences’ (in)ability to accept securitising moves. Accordingly, applying this ‘sociological’ approach to securitisation (which will be discussed at length below) – whereby social-historical contexts are seen as key in order to understand how securitisation works – allows us to see how actors and audiences are truly mutually constituted and context dependent. In effect, it also allows us to recognise that neither actors nor audiences, are “fully constituent [entities], across the board, […] but emerging [categories] that must be adjudicated empirically, before being set as a level of analysis” (Balzacq 2011a, p.2). In addition to the various critiques directed at the CS for its failure to provide adequate theoretical clarity regarding the concepts of actors and audiences, the CS has also been criticised for relying too much on the idea of language as performative, which has made the CS put too much emphasis on the speech act as an event and as a self-referential practise (McDonald 2008; Balzacq 2011a). Indeed, this kind of focus makes itself present in Security: A new Framework of Analysis (1998), as well as in Wæver’s earlier work (1995). It is problematic in two main ways. Firstly, the way in which the CS stresses the importance of language as performative, serves to make securitisation seem to be something that happens at a particular moment in time (McDonald 2008). This is problematic for several reasons. By focusing on ‘moments of securitisation’, the CS ignores the way in which issues can become constructed as security threats over extended periods of time (Bigo 2002; Abrahamsen 2005). Truly, securitisation is not an immediate or irreversible act (Salter 2008, p.325). For instance, the securitised issue of the war on drugs in the US has continued to rise and fall as a prominent ‘thing’ in the public imagination, “largely independent from the ‘actual’ or empirical degree of threat” (ibid). Thus, the fixity of the CS formulation of securitisation, which describes a very lineal trajectory of politicisation, securitisation, and (hopefully) de-securitisation, hinders investigation as to how security issues move in and out of security sectors over time (ibid). A second problem with the CS’s notion of securitisation, which relies too much on a speech act approach to securitisation and that pays too little attention to context and historical factors, is that it does not help us understand why a certain securitising move is successful at a particular moment in time. Also, such an approach does not provide clarity as to why a certain actor can speak security, or why a securitising move is received in a certain manner (McDonald 2008, p.576). For all of these questions, analysis has to include a wider time-span and a more constructivist understanding of how securitising discourses emerge and unfold, which a strictly textual and language-focused ST does not allow. With all of this in mind, the analysis undertaken in this article adopts a sociological approach to securitisation (Balzacq 2010). Rather than taking categories such as audiences and actors as static and pre-given, a sociological view permits us to constantly ‘look and see’ (Wittgenstein 1958; Donnelly 2013) and ultimately unpack, how actors securitising moves and audiences are all embedded in larger contexts and discourses (Stritzel 2007). As Mark Salter puts it, “the discourse of securitisation must be understood as situated within a relationship between speaker–audience and within a context that predates the actual securitizing act” (Salter 2008, p.326). In addition to the arguments previously made, the fruitfulness of adopting a sociological approach towards securitisation is that it allows for analysis to not only take discourse into account, but also practises. Because a sociological approach not only focuses on speech acts, it permits us also look at what happens beneath and above the level of securitising discourse. As pointed out by Balzacq (2011b), only focusing on what goes on at the discursive level misses out on the subtle, but decisive, processes of securitisation that exist around it (ibid, p.15). Indeed, a sociological take on securitisation makes way for research to focus on practises in addition to speech acts (Bigo 2001a; Bigo & Tsoukala, 2008). As has already been alluded to, securitisation may occur even when the word security is absent (Buzan et al., 1998). Indeed, the very nature of institutionalised securitisation, whereby a security issue has been taken so much for granted that actors no longer have to explain its threatening character, often results in a lack of drama, usually associated with a securitising move. Whilst it would be misleading to say that securitising discourse is absent in cases of institutionalised securitisation, securitising discourse may nonetheless become hidden. In order to reveal the processes at play in cases of institutionalised securitisation, analysis must therefore be able to also examine various institutions and practises that have been set up in order to deal with a given threat. As Sarah Léonard notes, in instances like these, “the acts of the bureaucratic structures or networks linked to security practices and the specific technologies that they use […] may play a more active role in securitisation processes than securitising speech acts” (2011, p.235). As pointed out by Balzacq (2011b, p.15) “securitising practises are enacted primarily through policy tools”. For Balzacq, policy tools refer to “tools used by agents [and/or] agencies to cope with public problems, defined as threats” (ibid). Because tools rest upon a kind of knowledge about a certain security issue, they can be seen to embody a specific threat image as well as a notion about what ought to be done about it (ibid, p.16). As a result, policy tools adopted to deal with security issues tell an audience “what the securitising actor is thinking” (ibid, p.17). Whilst Balzacq (2008) has explained the difference between policy tools and ‘instrument of securitisation’ in great length (2008, p.79), the way in which his argument will be utilised here concurs with Léonard’s use of it. In accordance with Léonard, securitising practises are understood as “activities that, by their very intrinsic qualities, convey the idea to those who observe them – directly or indirectly – that the issue they are tackling is a security threat” (Léonard 2011, p.237). There are two types of practises. The first are those practices that are often utilised in order to combat matters widely perceived as security issues. For instance, using the military to tackle an issue that previously has not been combatted in such a way, tells those observing that this is a serious matter. The second set of practises are the so-called ‘extraordinary’ (bid). Importantly, “extraordinary” here only means that the securitising practise used to combat the specific issue at hand, has not been utilised for this particular purpose in the past. Whilst the difference between these two sets of practises may be vague (indeed the two types overlap), the utility of adopting such a broad approach to “extraordinary measures” is linked to a more comprehensive understanding of what securitisation means (Léonard 2011, p.238). Rather than following the narrow understanding of securitisation, visible in how the CS arguably focuses too much on the existential character of threats, this broader understanding of security allows the subsequent analysis to approach the practises adopted by the Swedish government and police as securitising practises. As the analysis above makes evident, although the CS theorists themselves put forth the idea of institutionalised securitisation (Buzan et al., 1998), the concept does not sit well with the CS’s understanding of security as a speech act. Indeed, the traditional understanding of securitisation focuses too much on specific actors speaking security in particular moments in time, and too little on overarching contexts, discourses, and practises that perpetuate the idea of an issue as threatening. On the basis of this criticism, a new conceptualisation of institutionalised securitisation emerges. By building on the sociological understanding of securitisation outlined by Balzacq (2010; 2011b), the approach adopted in the subsequent analysis of the institutionalisation of the securitisation of illegal immigration in Sweden will be able to go beyond the shortcomings of a strictly speech-act focused notion of securitisation in two main ways. Firstly, by building on the idea that context and socio-historical processes really matter, the analysis undertaken below will contribute to the understanding that in order to properly grasp how processes of institutionalised securitisation emerge and unfold, we must focus not only on discourse as speech-acts but also as securitising practises, institutions, and bureaucratic developments. As the discussion above has sketched out, processes of securitisation may still be on-going even when securitising speech-acts seem concealed. By examining both bureaucratic developments as well as securitising practises, the article will be able to show how securitisation is not only about speech acts, but also about “the creation of networks of professionals of insecurity, the systems of meaning they generate, and the productive power of their practices” (Watson 2009, p.24). Indeed, as the case of the institutionalised securitisation of illegal immigration in Sweden shows, even when elaborate securitising rhetoric seems absent, a progressive securitisation may be taking place. Secondly, whilst a range of second generation scholars (McDonald 2008; Salter 2008; Stritzel 2007; Balzacq 2011b) have engaged with how the CS’s narrow notion of time, and its dependency on language as the only form of securitising moves, prohibit a comprehensive understanding of how processes of securitisation work when becoming institutionalised, further empirical and theoretical analysis is needed. Thus, the analysis below seeks to stress how multiple actors and audiences, on multiple levels, over extended periods of time, and in multiple ways, have, and continue to shape the institutionalisation of illegal immigration in Sweden. Whilst continuing attempts have been made (Bigo 2000; C.A.S.E. 2006; Balzacq 2005; Roe 2008) to develop a richer understanding for how various actors and audiences co-constitute security issues, an additional development will be made here. The analysis of institutionalised securitisation of illegal immigration in Sweden will show, that not only do different kinds of actors and audiences exist but also, as the institutionalisation of a securitisation process emerges and evolves through different levels (international and national), actors and audience may change places. Indeed, categories of actors and audiences are not mutually exclusive. Social subjects and/or institutions may at one point of a securitising process serve as the audience of a securitising move, and may at a later stage materialise as the securitising actor. On this premises, the argument proposed here is that we must begin to conceptualise securitisation as a multi-tiered process where the possibilities for actor–audience relationships are endless. As mentioned at the onset of this article, immigration has not always been seen as a potent security issue within the European Union (EU) (Boswell 2003; Huysmans 2000; van Muster 2009). Equally, before the 1980s, collaboration on the issue of immigration between EU member states was primarily orchestrated via the United Nations and the Council of Europe, and not through EU institutions (van Muster 2009, p.2; Lavenex 2001). However, in the 1980s and 1990s, European integration increasingly became understood as a key issue for the economic and politically stability of Europe. Simultaneously, various platforms within the EU increasingly linked the topic of immigration to that of international terrorism, trafficking and other illegal activity (van Muster 2009). Indeed, the Schengen Agreement contributed to the securitisation of immigration at the EU level (ibid). It is with this pre-established securitisation of immigration at the EU level in mind, that this section explores how the securitisation of illegal immigration in Sweden has become institutionalised. It does so by examining how two parallel developments – the implementation of the ICFs and REVA, have served to alter and intensify the ways in which the Swedish government and police work with the search for, and deportation of, illegal immigrants. During 2013 and 2014, major Swedish media outlets continuously reported on the newly discovered REVA project. According to the journalist Linda Stark, whose article in the magazine Re:public in December 2012 began the intense public debate surrounding REVA, REVA had resulted in an large increase of ICFs and an intensified police search for illegal immigrants, with the aim to increase the number of deportations of illegal immigrants in Sweden (Stark 2012, p.2). Following this, all major Swedish newspapers began to write about how REVA was directly linked to a substantial increase in the number of ICFs and multiple public demonstrations against REVA were organised (Rasmusson 2013; Karlsson 2013; Expressen 2013; Bergquist 2013; Hrustic 2013). Also, as citizens began to observe an increase in ICFs in the subway of Stockholm in the early spring of 2013, human rights organisations and individual activists created Facebook groups in order to warn illegal immigrants of when and where ICFs were taking place (Expressen 2013). As a result of popular criticism, politicians and police began to counter the intense and widely shared opposition towards REVA. For instance, the Stockholm police issued a statement on 1st March 2013, declaring that REVA had nothing to do with the ICFs (Polisen 2013a). Likewise, the Chairman of the National Social Insurance Committee, Gunnar Axén from the Conservative Party - Moderaterna - defended REVA by stating that the project had not called for an increase in ICFs, but only for a more effective decision making process in regards to deportations of illegal immigrants (Axén 2013). Whilst it is correct that REVA did not explicitly ask for an increase in ICFs, statistics from the Central Border Control Agency nevertheless confirm that the number of ICFs in Sweden increased from 28 092 in 2009, to 42 467 in 2012 (Leander 2014, p.6). In order to understand how this development took place, we must trace the two aforementioned parallel processes - the ICFs and REVA - back to their origin. The next section will map out the first of these two developments, the effects on the Schengen Agreement on Swedish border policing post-2001. Sweden became an operational member of Schengen in March 2001 (SOU 2004). Whilst the official aim of the Schengen Agreement has been to create a zone of free movement, the agreement has meant that external border controls have been replaced by so-called CMs, such as the ICFs (van Muster 2009). As visible in the Swedish governmental report on border policing from 2004, the government recognised the demand by the Schengen Agreement to intensify the number of ICFs, as a CM, in order to counter “illegal smuggling of people and other criminal activity” (SOU 2004, p.62). Despite the Swedish government clearly recognising the demand for the increase in the number of ICFs, the employment of the ICFs continued to be a task only carried out by Swedish border police until 2007 (Leander 2014). Then, in 2007, the National Police Board decided that ICFs should be an integrated part of everyday police work. The National Police Board also decided that from then on, annual statistics would be collected on the number of ICFs carries out in order to make sure that the CMs called for by the Schengen Agreement were met (Leander 2014, p.7). In 2011, the National Police Board published the report, ‘The National Police Board’s General Recommendations Regarding ICFs’, which made clear that ICFs had to be an integral part of everyday police work, and which called on each regional police authority to work actively with ICFs (Rikspolisstyrelsen 2011, p.2). The second parallel development that has institutionalised the securitisation of illegal immigration in Sweden is REVA. REVA, which stands for “Legally Secure and Efficient Enforcement”, is a governmental project initially implemented in the region of Skåne in 2009 with the aim of making the deportation process of people whose asylum request had been rejected more effective, in order to thereby increase the number of deportations (Justitiedepartementet 2008a). REVA is a united action project comprising three governmental agencies–the Swedish Migration Board, the Swedish National Police Board, and the Swedish Prison and Probation Service. The project was initiated by the Swedish government in 2008 through its annual appropriation directions to the three above mentioned government agencies. REVA was included in the appropriation directions between 2008-2013, after which the procedures introduced through REVA were made standard procedures of the three governmental agencies (Leander 2014). The report, which preceded REVA was partly financed by the European Return Fund (Migrationsverket 2012). On the recommendations made by this report, REVA set out to make the collaboration between the three government agencies work more effectively with the ultimate aim of increasing the number of deportations (ibid). In terms of increasing the number of deportations, REVA was successful. Between the start of 2008 and the end of 2012, the number of executed deportations rose from 4800 to approximately 7000 (Polisen 2013b, p.11). 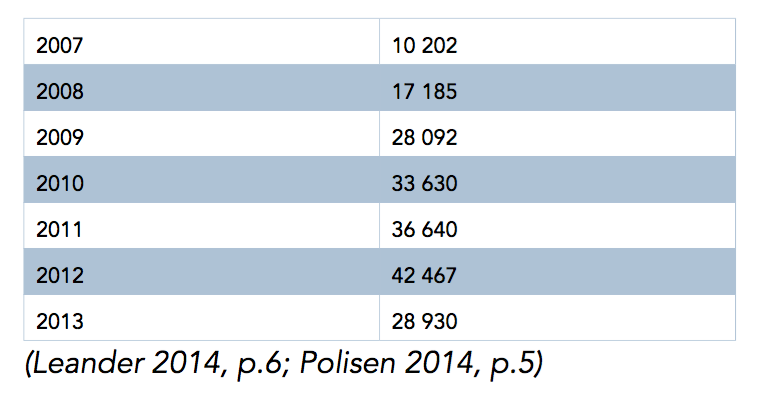 In Stockholm, the number of executed deportations increased by 47% between 2010 and 2012 (Fremnell 2013, p.1). The great rise in the number of deportations carried out by the police can be explained both by an increase in the number of deportation cases received by the police from the Migration Board, and because of the police’s increased efficiency when executing deportations (Polisen 2013b, p.11). Thus, REVA succeeded in its aim of making the police deport more illegal immigrants than before. In terms of the relationship between REVA and the ICFs, REVA did not officially give the police, or any other governmental body, extended authority to search for illegal immigrants. Nevertheless, the appropriation directions to the National Police Board between 2008 and 2013, whilst never explicitly demanding an increase in ICFs, did, by demanding an increase in the number of executed deportations, put increased pressure on the police to further extend the number of ICFs carried out. As the police chief of the Border Control Agency in Malmö, Kristina Hallander Spångberg, explained in a 2013 radio interview, the 2009 report, which aimed at making the Police’s deportation process more effective, made the police carry out ICFs in a more effective manner (Landelious 2013). In 2014, Kristina Hallander Spångberg further explained that because the appropriation directions from the Swedish government between 2008 and 2013 declare that the police had to increase the number of deportations of illegal immigrants, it had resulted in both an increase of ICFs and a more effective collaboration between the Police, the Migration Board, and the Prison and Probation Service (Leander 2014, p.8-9). After having first been implemented in the region of Skåne, REVA was thereafter implemented by all regional police organisations post-2011 (Polisen 2013b, p.12). As statistics from the Central Border Control Authority demonstrates, the number of ICFs continued to increase steadily after the implementation of REVA. When examining the statistics as outlined above, a few things need to be kept in mind. Firstly, the city of Malmö saw a rapid increase in gang related violence in 2011. This resulted in the local police authority increasing the number of police personnel patrolling the city. Whilst this was meant as an effort to prevent further crime taking place, it also resulted in further increasing the numbers of ICFs in Malmö during 2011 (Funke 2014). Secondly, as mentioned above, 2011 was the year in which the National Police Board published a report calling on all regional police authorities to make ICFs an integral part of everyday policing, which arguably also added to the rapid increase in ICFs (Rikspolisstyrelsen 2011, p.2). Thirdly, the increase in ICFs does not follow an increase in total immigration to Sweden. As the figures from ‘Statistics Sweden’ show, whilst the ICFs rose rapidly between 2007-2013, Sweden witnessed a downfall in total immigration in 2010 and 2011 (see appendix 1). Finally, whilst no single explanation has been found to explain the downfall in ICFs between 2012 and 2013, statements made by local police officers indicate that the downturn in ICFs is a result of insufficient economic resources (Sandin 2014; Jalkner 2013). As the above sections make evident, the processes by which the number of ICFs increased as a result of Sweden joining Schengen, and how the number of deportations rose due to REVA, involve three main actors: the EU through the Schengen Agreement, the Swedish government, and the Swedish police. These three actors have together served to institutionalise the securitisation of illegal immigration in Sweden. Subsequently, in order to better unpack this process, the next section will turn to examining the language used by the two actors at the national level of Sweden–the Swedish government and the Swedish police. The EU has certainly played a central role in the institutionalisation of the securitisation of illegal immigration. However, this article wants to examine how this process has trickled down to the national level in Sweden. Thus, the next section will only focus on how the Swedish government and police have spoken about REVA and the ICFs. It will be shown how the securitisation of illegal immigration has been taken for granted due to an underlying acceptance of illegal immigration as a potent security issue. The next section will firstly conduct a DA over the language that has been uses in relation to REVA and the ICFs by the government and the police. Secondly, the section will turn once again to ST in order to spell out exactly how we see an institutionalisation of the securitisation of illegal immigration taking place in Sweden. “The National Police Board, the Migration Board, and the Prison and Probation Service shall through consultation evaluate the work conducted to execute deportations and refusals of entries. The institutions shall, based on this evaluation, take necessary action in order to increase the number of enforced deportations and refusals of entry” (Justitiedepartementet 2008b, p.5 emphasis added). In the appropriation direction to the National Police Board for 2010, the government declared that the institution would be given 10,000,000 SEK in order to “further improve and make more effective the work conducted in relation to refusals of entries and deportations that have had their final judgement” (Justitiedepartementet 2009, p.5 emphasis added). “The Swedish National Police Board […] shall through consultation make more effective the work conducted to execute deportations and refusals of entries, with the purpose of substantially increasing the amount of applied verdicts” (Justitiedepartementet 2011, p.7 emphasis added). “The Swedish National Police Board […] shall through consultation make more effective the work conducted to execute deportations and refusals of entries, with the purpose of, relative to the number of deportations in 2012, substantially increase the amount of applied verdicts of people registered at the Swedish Migration Board” (Justitiedepartementet 2012, p.4 emphasis added). “…The National Police Board shall report how the experiences of the common strides towards affectivity and implemented projects will be utilised henceforth” (Justitiedepartementet 2013, p.5 emphasis added). “It is correct […] that the REVA project has been intensified […] This is not that remarkable […] We have sufficient problems today with people who, after having had their asylum request denied, refuse to leave Sweden […] This has huge financial implications” (Riksdagen 2013a, p.5). “Over the last years, there has been a massive increase in the number of cases of refused asylum requests that have been handed over from the Swedish Migration Board to the police. Right now that number is at about 19,500. This is a lot. This is not acceptable, neither from an economic- nor from a humanitarian perspective, and this is why the government has put clear pressure on the Migration Board, the police and the Prison and Probation Service to make their work with deportations more effective” (Riksdagen 2013b, p.2). In addition to the rhetoric displayed by the government regarding REVA, examining the language used concerning the ICFs in the governmental report “Border Control Law–a More Efficient Border Control” from 2004, also shows how the government did not problematize the implementation of the ICFs. As the government declared, “in order to ensure that the free movement [between Schengen member states] does not aid international criminality, compensatory measures must be set in place” (SOU 2004, p.58). The report further described the CM as measures taken in order to “prevent the smuggling of persons and other criminal activity”. Further, the report also stated that the Schengen Agreement meant an obligation upon Sweden to “expel people who do not have the right to reside within the Schengen territory” (bid, p.62). And also, that the compensatory measures are meant to “prevent people who pose a threat to the general order and security from entering and residing within the Schengen Area” (ibid, p.282). “As Sweden joined Schengen in 2001 we also agreed to pursue so-called compensatory measures. The aim of these compensatory measures is to prohibit that the removal of the border controls [between Schengen member states] lead to increased criminality and illegal immigration. To reinforce the ICFs is an important part of these measures” (Riksdagen 2006, p.1). “ […] REVA is a project meant to increase the number of applied verdicts in relation to deportations. The commission comes directly from the government. The ICFs are so-called compensatory measures […] All Schengen member states have undertaken the task to carry out ICFs in order to counter illegal stay within the Schengen area” (Sahlström 2013, p.1 emphasis added). Similarly, the regional police organisation in Stockholm declared that REVA “is partly financed by the European Return Fund […] REVA corresponds to the Government’s intention to make more effective the work with increasing the number of deportations and applied verdicts” (Fermnell 2012, p.1). A comparable message was also provided by the National Police Board in its report regarding deportations from 2013. The report clarified that, “The appropriation direction from 2012 declares that the National Police Board, the Migration Board and the Prison and Probation Service shall collaborate in order to make the efforts concerning deportation more effective in order to increase the number of applied verdicts” (Polisens 2013b, p.9 emphasis added). In another report regarding ICFs, the Police stated that, “in line with the Schengen Agreement, the Swedish police, not only can, but has to, conduct ICFs” (Polisen 2014, p.5 emphasis added). The same arguments regarding REVA and the ICFs were repeatedly stated in various official statements and opinion pieces by both local police authorities and the National Police Board (Fremnell 2012; Norberg 2013; Rikspolisstyrelsen 2013; Polisen 2009; Nitz 2013). The aim of this article has been to investigate how the Swedish government and police have institutionalised the securitisation of illegal immigration. As stated in the introduction, the article set out to answer the question–Where Does Securitisation Begin? 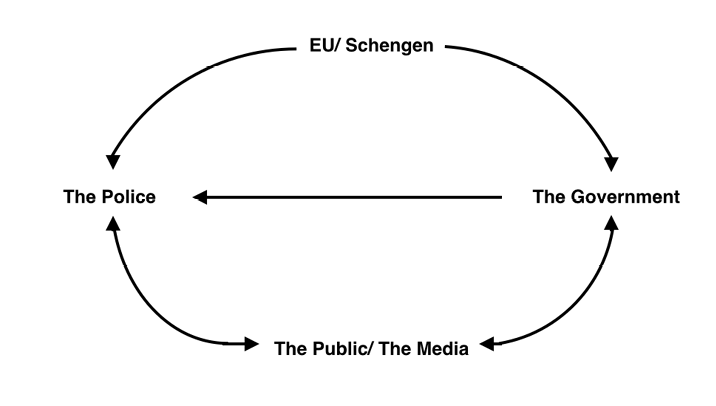 As the diagram below demonstrates, the first stage of the process by which the securitisation of illegal immigration has trickled down to the national level of Sweden was through the Schengen Agreement. The Schengen Agreement called on Sweden to implement CM, e.g. the ICFs, in order to assure that the free movement within Schengen did not result in the “illegal smuggling of people and other criminal activity” (SOU 2004, p.62). In addition, the EU has also, through the European Return Fund, ‘spoken security’ to the Swedish government by finically supporting REVA, which aimed at increasing the number of deportation of illegal immigrant (Migrationsverket 2012). Figure 1. How the Securitisation of Illegal Immigration at the EU Level has Filtered Down to the National Level of Sweden through the Schengen Agreement. As previously explained, the result of the EU ‘speaking security’ to Sweden in this way has been clear. Firstly, the ICFs were made customary practice by the Swedish police post-2001. And after the National Police Board declared that the ICFs should be an integral part of everyday police work, the ICFs rose by 183,5% between 2007 and 2013 (Leander 2014, p.6; Polisen 2014, p. 5). Secondly, the process by which the government’s REVA project called for a considerable rise in executed deportations, resulted in an increase by 45,8% between 2009 and 2013 (Polisen 2014). The second stage of the process by which the securitisation of illegal immigration at the EU level has trickled down to the national level of Sweden, concerns how the Swedish government and police have institutionalise this securitisation. This stage of the process concerns the REVA project itself. Judging by the appropriation directions to the police between 2008 and 2013, it is clear that the government saw illegal immigration as a potent security issue. After the first few appropriation directions in 2008 and 2009 ordered the police to increase the number of executed deportations, the appropriation directions in 2011, 2012 and 2013 asked the police to “substantially increase the amount of applied verdicts” (Justitiedepartementet 2012, p.4 emphasis added). Consequently, not only did the government order the police to prioritise the execution of deportations, but this order also intensified over time. Indeed, as Bigo (2001b) argues, the place in which security is most often spoken in Western societies today is not primarily in political speeches, but rather within bureaucratic systems. As the context surrounding REVA and the appropriation directions to the police show, they were neither preceded by any official political debate, nor by any evident securitising move on behalf of specific politicians. Rather, it is the appropriation directions themselves that display how illegal immigration is perceived as a potent security issue by the Swedish government, one that ‘goes without saying’. As evident by the appropriation directions between 2008 and 2013, the Swedish government has already institutionalised the securitisation of illegal immigration, which is why no elaborate rhetoric is needed. To quote the CS, when securitisation has become institutionalised, “constant drama does not have to be present, because it is implicitly assumed that when we talk of this […], we are by definition in the area of urgency” (Buzan et al., 1998, p.27 original emphasis). As the image below clarifies, in the second phase of the institutionalisation of the securitisation of illegal immigration in Sweden, the Swedish government spoke security to both police and the public, through the appropriation directions, and the succeeding political debates, regarding REVA. Figure 2. How the Swedish Government has Spoken Security to the Police and the Public Through REVA. Withal, the institutionalised character of the securitisation of illegal immigration in Sweden also becomes evident when recognising that intense debate and contestation regarding REVA only arose after the project became public in 2012. Indeed, only then did REVA and the ICFs become criticised and problematised, and not by the ruling government, but by journalists and citizens. Indeed, the way in which the government and police refused to see the problematised issues surrounding REVA and the ICFs exposes how the threat image of illegal immigration at the EU level has been internalised by the two institutions. As also displayed above, in regards to how the police spoke about REVA and the ICFs, the official statements issued by the police clearly show how they tried to elevate the criticism by stating that the police only followed orders set out by the government and/or the EU. The lack of clear securitising moves on behalf of the police, explaining why illegal immigration poses such a great threat to the Swedish society, also shows that the securitisation of illegal immigration has become institutionalised (Fremnell 2013; Norberg 2013; Rikspolisstyrelsen 2013; Polisen 2009). In addition to how the initial lack of debate regarding REVA reveals how the securitisation of illegal immigration has become institutionalised, the government’s decision to make REVA standard bureaucratic procedure in 2012 also points to this institutionalisation (Justitiedepartementet 2013). As Vieira argues, an issue has become institutionalised “if the threat […] is resilient enough to demand the build-up of standing bureaucracies and procedures” (2007, p.140). Indeed, in the case of Sweden, one becomes strikingly aware of the lack of elaborate rhetoric bluntly depicting illegal immigration as an existential threat, and REVA as the solution to that threat. Thus, whilst the CS tells us that we should not be fooled by an absence of drama, the case of REVA clearly shows the usefulness of taking Léonard’s (2011) claim seriously. As REVA displays, in instances of institutionalised securitisation, bureaucratic structures may actually “play a more active role in securitisation processes than securitising speech acts” (2011, p.235). Just like Léonard suggests, the case of REVA shows how “securitising practises” (2011, p.237), i.e. the intensified focus on executing deportations and carrying out ICFs by the Swedish police, indeed are activities that, “by their very intrinsic qualities, convey the idea to those who observe them, directly or indirectly, that the issue they are tackling is a security threat” (Léonard 2011, p.237). Indeed, the many critical newspaper articles regarding REVA confirms how these securitising practices, in themselves, have served to communicated to the public that the government and the police saw illegal immigration as a pressing security threat to Sweden. By examining the case of how the securitisation of illegal immigration has become institutionalised in Sweden, the need for a more dynamic understanding of institutionalisation within ST becomes apparent. Certainly, applying a strictly speech acts approach to securitisation (Waever 1995) when investigating processes of institutionalised securitisations makes it difficult to make sense of the Swedish case study, as securitising discourses have become so internalised that they no longer have to be uttered. Truly, as previously examined in section 2, applying a sociological approach (Balzacq 2011) when looking at the institutionalisation of securitisation processes proves much more useful. Such an approach goes beyond the focus on speech acts to include historical contexts and developments, political and bureaucratic, in order to map out how processes of securitisation evolve and change over time. By adopting a sociological approach to securitisation, analysts are also given sufficient theoretical tools to examine, as this Swedish case study shows, how securitising actors and audiences may change over time. As REVA and the ICFs display, the Swedish government and police have at one point possessed the position of the securitising audience, spoken to by the EU through the Schengen Agreement. Then, later, the same government and police possess the role of the securitising actors, which through REVA and the ICFs replicate the same securitisation of illegal immigration towards the Swedish media and public. As the below imaged shows, the answer to the original question of this article–Where Does Securitisation Begin?–is that if we take historical and contextual factors seriously, we can begin to trace the process of securitisation of illegal immigration back, through bureaucratic developments and political initiatives. When doing so for this case study, we see how the securitisation of illegal immigration did not begin at the national level of Sweden, but has filtered down from the international level of the EU. We also see how the process of institutionalised securitisation is multi-tiered and complex, with several actor- audience relationships taking place at the same time. Thus, what the case of the institutionalised securitisation of illegal immigration in Sweden shows, is that we must always look at the context, historical, political, and social, in order to be able to see how processes of securitisations change and evolve over time. Figure 3. The institutionalisation of the securitisation of illegal immigration transcends both the level of the EU and the national level of Sweden. The process involves several, and parallel, actors - audiences relationships. This article has investigated how processes of securitisation work when they become institutionalised. This was done by looking at the case study of Sweden, and specifically at the emergence of the ICFs and REVA. Consequently, the article has sought to show how the securitisation of illegal immigration at the EU level has been internalised and replicated by the government and police at the national level of Sweden. Thus, the article has shed light on the question – Where Does Securitisation Begin? This was done by developing further the concept of institutionalisation within ST. By bridging ST with the specific case study of Sweden, the article advanced a more dynamic concept of institutionalisation, one that also accounts for historical contexts and bureaucratise developments in order to examine how securitisation may advance even when securitising discourses seem hidden. The article began by looking closer at the original formulation of ST. Special attention was given to the concept of institutionalisation within ST. By thereafter engaging with, and expanding on, the various critiques posed by the second generation, the article sought to advance a more applicable understanding of institutionalisation within ST. Especially, the importance of adopting a sociological approach to ST was highlighted, as well as the importance of also including institutional- and bureaucratic developments, in addition to speech acts, when looking at processes of institutionalised securitisations. Indeed, the article has aimed to also highlight how securitising practises can further processes of securitisation. As the article moved to its cases study, the way in which the securitisation of illegal immigration, through the Schengen Agreement, has trickled down to the level of Sweden became most apparent. It was examined how the ICFs became gradually intensified in Sweden, as a CM, post 2001, and how the REVA project was implemented in 2008. As revealed, the ICFs and REVA were not preceded by any national political discussion on the necessity or implications of these developments. Subsequently, it was demonstrated how the securitisation of illegal immigration has become internalised by the Swedish government and police. By then conducting DA of the language used by the government and the police in regards to REVA and the ICFs, the way in which both institutions had internalised illegal immigration as a potent security threat became apparent. By returning to the concept of institutionalisation, the article concluded by arguing for the necessity of approaching cases of institutionalised securitisation through a sociological approach. It has been argued, that such an approach will help analysis go beyond the notion of ‘moments of securitisation’ and instead look at how processes of institutionalised securitisations emerge over extended periods of time, and may transcend the international level down to the national. The article argued for the necessity to not take securitising actors and audiences as pre-given categories, but to constantly ‘look and see’ (Wittgenstein 1958; Donnelly, 2013), in every new case of securitisation, who the actor(s) and the audience(s) really are. Indeed, as the empirical example in Sweden has revealed, there may exist an endless number of actor-audience relationships at the same time. Indeed, this article has raised questions about what happens when processes of securitisation become institutionalised. Obviously, further analysis is required regarding the role that the public and the media have played in the case of Sweden. Whilst this article briefly looked at how the public and media pushed back against the government’s and the police’ securitisation of illegal immigration, further analysis should be conducted in order to map out exactly how the public and the media has effected the securitisation process in Sweden. Also, the article has not had time to examine how exactly the relationship between the EU and Sweden has furthered the securitisation of illegal immigration. Because of this, further study regarding the relationship between the EU and Sweden should be undertaken. What this article has hoped to do, is to show that we must continue to be critical towards that which might be taken for granted. Indeed, even if bureaucratic and institutional developments are often explained as ‘natural’ responses to deal with ‘obvious’ problems, we must always seek to go beyond the ‘obvious’. As this and other investigations display, state security does not necessarily imply security for the person. Ergo, the task at hand is to keep questioning the established power structures at play that benefit some whilst silencing others. Åberg, E. (2013). Protest mot Projekt Reva. Dagens Nyheter. [Online]. 7 March 2013. Available at: https://www.dn.se/sthlm/protest-mot-projekt-reva/ [Accessed 12 April 2018]. Abrahamsen, R. (2005) ‘Blair’s Africa: The Politics of Securitization and Fear’, Alternatives, 30(1), pp. 55-80. Aradau, C. (2004) ‘Security and the Democratic Scene: De-securitization and Emancipation’, Journal of International Relations and Development, 7, pp. 388-413. Axén, G. (2013). Syftet med reva är en mer effektiv avvisningsprocess. Aftonbladet. [Online]. 22 February 2013. Available at: https://www.aftonbladet.se/debatt/debattamnen/politik/article16296371.ab [Accessed 12 April 2018]. Balzacq, T. (2005) ‘The Three Faces of Securitisation: Political Agency, Audience and Context’, European Journal of International Relations, 11(2), pp. 171-201. Balzacq, T. (2008) ‘The Policy Tools of Securitization: Information Exchange, EU Foreign and Interior Policies’, JCMS: Journal of Common Market Studies, 46(1), pp. 75-100. Balzacq, T. (2010) ‘Constructivism and securitization studies’, in: Dunn Cavelty, M. and Mauer, V. (eds. ), The Routledge Handbook of Security Studies. London: Routledge, pp. 56-72. Balzacq, T. (ed. ), Securitization Theory: How Security Problems Emerge and Dissolve. Abingdon: Routledge, pp. 1-30. Balzacq, T. (ed.) (2011a) Securitization Theory: How Security Problems Emerge and Dissolve. New York: Routledge. Bankel, AK. (2013). Protester mot Polisens Id-Kontroller i T-Banan. SVT. [Online]. 22 February 2013. Available at: https://www.svt.se/nyheter/lokalt/stockholm/protester-mot-polisens-id-kontroller-i-t-banan [Accessed 12 April 2018]. Behnke, A. (2006) ‘No Way Our: Desecuritization, Emancipation and the Eternal Return of the Political–A Reply to Aradau’, Journal of International Relations and Development, 9,pp. 62-69. Bergquist, H. (2013). Kontroller i t-banan bryter mot folkrätten. Svenska Dagbladet. [Online]. 26 February 2013. Available at: https://www.svd.se/kontroller-i-t-banan-bryter-mot-folkratten [Accessed 12 April 2018]. Bigo, D. (2000) ‘When Two Becomes One: Internal and External Securitisations in Europe’, in Kelstrup, M. and Williams, M. C. (eds. ), International Relations Theory and the Politics of European Integration: Power, Security and Community. London: Routledge, pp. 171–204. Bigo, D. (2001a) ‘Migration and Security’ in Guiraudon V. and Joppke, C. (eds. ), Controlling a new migration world. London: Routledge, pp. 121-149. Bigo, D. (2001b) ‘The Möbius Ribbon of Internal and External Securit(ies)’, in Albert. M., Jacobsen, D., and Lapid, Y. (eds), Identities, Borders, Orders. Rethinking International Relations Theory. Minneapolis: University of Minnesota Press, pp. 91–116. Bigo, D. (2002) ‘Security and Immigration: Toward a Critique of the Governmentality of Unease’, Alternatives Special Issue, 27, pp. 63-92. Bigo, D. and Tsoukala, A. (2008) ‘Understanding (in)security’, in Bigo, D. and Tsoukala, A. (eds.) Terror, Insecurity and Liberty: Illiberal Practices of Liberal Regimes After 9/11. London: Routledge, pp. 1-9. Boswell, C. (2003) European Migration Policies in Flux: Changing Patterns of Inclusion and Exclusion. London: Blackwell Publishing. Buonfino, A. (2004) ‘Politics, Discourse and Immigration as a Security Concern in the EU: A Tale of Two Nations, Italy and Britain’, Conference ECPR Joint Sessions of Workshops. Uppsala. Buzan, B. (2006) ‘Will the ‘global war on terrorism’ be the new Cold War?’, International Affairs, 82(6), pp. 1101-1118. Buzan, B. (2009) People, States and Fear: An Agenda for International Security Studies in the Post-Cold War Era. London: Harvester Wheatsheaf. Buzan, B. and Hansen, H. (2009) The Evolution of International Security Studies. Cambridge: Cambridge University Press. Buzan, B. and Wæver, O. (2003) Regions and Powers: The Structure of International Security. Cambridge: Cambridge University Press. Buzan, B. and Wæver, O. (2009) ‘Macrosecuritization and Security Constellations: Reconsidering Scale in Securitization Theory’, Review of International Studies, 35(2), pp. 253-276. Buzan, B., Wæver, O. and de Wilde, J. (1998) Security: A New Framework For Analysis. London: Lynne Reinner Publishers, Inc.
C.A.S.E. Collective. (2006) ‘Critical Approaches to Security in Europe: A Networked Manifesto’, Security Dialogue, 37(4), pp. 443-487. Ciutå, F. (2009) ‘Security and the Problem of Context: a Hermeneutical Critique of Securitisation Theory’, Review of International Studies, 35(2), pp. 301-326. Dagens Nyheter. (2013). Avblås jakten på gömda. Dagens Nyheter. [Online]. 23 February 2013. Available at: https://www.dn.se/ledare/huvudledare/avblas-jakten-pa-gomda/ [Accessed 12 April 2018]. Donnelly, F (2013) Securitisation and the Iraq War: The Rules of Engagement in World Politics. London: Routledge. Dunn Cavelty, M. (2008) Cyber-Security and Threat Politics: US Efforts to Secure the Information Age. New York: Routledge. Elbe, S. (2006) ‘Should HIV/AIDS Be Securitized? : The Ethical Dilemmas of Linking HIV/AIDS and Security’, International Studies Quarterly, 50(1), pp. 119-144. Ette, A. and Fais, T. (2007) ‘The Europeanization of National Policies and Politics of Immigration: Research, Questions and Concepts’, in Faist F. and Ette. (eds. ), The Europeanization of National Policies and Politics of Immigration: Between Autonomy and the European Union. Basingstoke: Palgrave Macmillan, pp. 3-31. Expressen. (2013). Varnar för Polisens Reva-kontroller. Expressen. [Online]. 30 March 2013. Available at: https://www.svd.se/varnar-for-polisens-reva-kontroller [Accessed 12 April 2018]. Farrell, T. (2002) ‘Constructivist Security Studies: Portrait of a Research Program’, International Studies Review, 4(1), pp. 49-72. Fremnell, J. (2012). Rättssäker inre utlänningskontroll. The Police. [Online]. 13 December 2012. Available at: https://polisen.se/Stockholms_lan/Arkiv/Nyhetsarkiv/Stockholm/2012/Rattssaker-inre-utlanningskontroll/ [Accessed 12 April 2018]. Fremnell, J. (2013). Arbetet med REVA påbörjat. The Police. [Online]. 19 February 2013. Available at: https://polisen.se/Stockholms_lan/Arkiv/Nyhetsarkiv/Stockholm/2012/Arbetet-med-REVA-paborjat-inom-granspolisavdelningen-Stockholm/ [Accessed 12 April 2018]. Funke, M. (2014). “Historien om Reva”. Kaliber Nyhetsdokumentär. 23 March 2014. Podcast. Available at http://sverigesradio.se/sida/avsnitt/333995?programid=1316 [Accessed 12 April 2018]. Hansen, L. (2000) ‘The Little Mermaid’s Silent Security Dilemma and the Absence of Gender in the Copenhagen School’, Millennium, 29(2), pp. 285-306. Hansen, L. (2001) ‘Reconstructing Desecuritization: The Normative-Political in the Copenhagen School and Directions of How to Apply it’, Review of International Studies, 38(3), pp. 525-546. Hansen, L. (2006) Security as Practise: Discourse Analysis and the Bosnian War. Oxon: Routledge. Hansen, L. (2011) ‘Theorizing the image for Security Studies: Visual securitization and the Muhammad Cartoon Crisis’, European Journal of International Relations, 17(1), pp. 51-74. Heberlein, A. (2013). Ann Heberlein: Människorna som söker skydd och trygghet hos oss är inte farliga. Dagens Nyheter. [Online]. 22 February 2013. Available at: https://www.dn.se/kultur-noje/kulturdebatt/ann-heberlein-manniskorna-som-soker-skydd-och-trygghet-hos-oss-ar-inte-farliga/ [Accessed 12 April 2018]. Hrustic, E. (2013). Närmare 1000 tågade mot polisens ID-kontroller. SVT. [Online] 9 March 2013. Available at: http://www.svt.se/nyheter/regionalt/skane/demonstration-mot-polisens-kontroller [Accessed 12 April 2018]. Huysmans, J. (2000) ‘The European Union and the Securitization of Migration’, Journal of Common Market Studies, 38(5), pp. 751-777. Jalkner, H. (2013). Färre utlänningskontroller i länet. Corren.se. [Online]. 11 March 2013. Available at: http://www.corren.se/nyheter/farre-utlanningskontroller-i-lanet-6334581.aspx [Accessed 12 April 2018]. Jorgensen, M. and Phillips, L. J. (2002) Discourse Analysis as Theory and Method. London: SAGE Publications. Justitiedepartementet (2008a). Regleringsbrev för budgetåret 2009 avseende Migrationsverket. Ju2008/942/SIM. Stockholm: The Swedish Department of Justice. Justitiedepartementet (2008b). Regleringsbrev för budgetåret avseende 2009 Rikspolisstyrelsen och övriga myndigheter inom polisorganisationen. Ju2008/8581/PO. Stockholm: The Swedish Department of Justice. Justitiedepartementet (2009). Regleringsbrev för budgetåret avseende 2009 Rikspolisstyrelsen och övriga myndigheter inom polisorganisationen. Ju2009/1335/PO. Stockholm: The Swedish Department of Justice. Justitiedepartementet (2010). Regleringsbrev för budgetåret avseende 2011 Rikspolisstyrelsen och övriga myndigheter inom polisorganisationen. Ju2010/1416/PO. Stockholm: The Swedish Department of Justice. Justitiedepartementet (2011). Regleringsbrev för budgetåret avseende 2012 Rikspolisstyrelsen och övriga myndigheter inom polisorganisationen. Ju2011/561/PO. Stockholm: The Swedish Department of Justice. Justitiedepartementet (2012). Regleringsbrev för budgetåret avseende 2013 Rikspolisstyrelsen och övriga myndigheter inom polisorganisationen. Ju2012/7557/PO. Stockholm: The Swedish Department of Justice. Justitiedepartementet (2013). Regleringsbrev för budgetåret avseende 2013 Rikspolisstyrelsen och övriga myndigheter inom polisorganisationen.Ju2013/8211/PO. Stockholm: The Swedish Department of Justice. Karlsson, P. (2013). Ny kritik mot Reva-projektet. Aftonbladet. [Online]. 1 March 2013. Available at: https://www.aftonbladet.se/nyheter/article16337183.ab [Accessed 12 April 2018]. Knudsen, Olav F. (2001) ‘Post-Copenhagen Security Studies: Desecuritizing Securitisation’, Security Dialogue, 32(3), pp. 355-368. Landelious, A. (2013). “Fler avvisningar med nytt polisprojekt–Mycket nöjda med resultaten”. SVT. 10 March 2013. Podcast. Available at: http://sverigesradio.se/sida/artikel.aspx?programid=83&artikel=5468255 [Accessed 12 April 2018]. Lavenex, S. (2001) The Europeanisation of Refugee Policies: Between Human Rights and Internal Security. Aldershot: Ashgate. Leander, P. (2014). Skyldig tills motsatsen bevisas–En granskning av polisens inre utlänningskontroller. Stockholm: Arena Idé. Léonard, S. (2011) ‘EU border security and migration into the European Union: FRONTEX and Securitisation Through Practices’, European Security, 19(2), pp. 231-254. Lindell, L. (2013). Protest mot Reva samlade hundratals. Göteborgs Posten. [Online]. 2 March 2013. Available at: http://www.gp.se/nyheter/göteborg/protest-mot-reva-samlade-hundratals-1.513862 [Accessed 12 April 2018]. McDonald, M. (2008) ‘Securitization and the Construction of Security’, European Journal of International Relation, 14(4), pp. 563-587. Migrationsverket (2012). Projekt medfinansierat av Europeiska återvändandefonden 2012. The Migration Board. [Online]. 24 May 2012. Available at: http://www.migrationsverket.se/download/18.5e83388f141c129ba6312ab8/1381926423879/projekt_rf_2012.pdf [Accessed 12 April 2018]. Milliken, J. (1999) ‘The Study of Discourse in International Relations: A critique of research and Methods’, European Journal of International Relations, 5(2). pp. 225-254. Mitsilegas, V., Monar, J., Rees, W. (2003) The European Union and Internal Security: Guardian of the People? Hampshire, Palgrave Macmillan. Neumann, B. I. (2008) ‘Discourse Analysis’, in Klotz, A. and Prakash, D. (eds. ), Qualitative Methods in International Relations: A Pluralist Guide. Hampshire: Palgrave MacMillan. pp. 61-77. Nitz, L. (2013). Polisförbundet: Jakten på effektivitet får aldrig gå ut över rättssäkerheten. Dagens Arena. [Online]. 1 March 2013. Available at: http://www.dagensarena.se/opinion/polisforbundet-jakten-pa-effektivitet-far-aldrig-ga-ut-over-rattssakerheten/ [Accessed 12 April 2018]. Norberg ,Y. (2013). Hur hanterar vi den inre utlänningskontrollen? The Police. [Online]. 1 March 2013. Available at: https://polisen.se/Stockholms_lan/Arkiv/Nyhetsarkiv/Stockholm/2012/Hur-hanterar-vi-den-inre-utlanningskontrollen/ [Accessed 12 April 2018]. Nye, J.S.Jr. and Lynn-Jones, S.M. (1988) ‘International Security Studies: A Report of a Conference on the State of the Field’, International Security, 12(4), p. 5-27. Polisen. (2009). Verksamhetsplan 2009. Malmö: Skåne Police Board. Polisen. (2013a). Hur hanterar vi de inre utlänningskontrollerna? The Police. [Online]. 1 March 2013. Available at: https://polisen.se/Arkiv/Nyhetsarkiv/Stockholm/2012/Hur-hanterar-vi-den-inre-utlanningskontrollen/ [Accessed 12 April 2018]. Polisen. (2013b). Tillsynsrapport 2013:10 Handläggningen av Polisens verkställighetsärenden i samband med avvisnings- och utvisningsbeslut. Stockholm: The National Police Board. Polisen. (2014). Tillsynsrapport 2014:14 Inre utlänningskontroll. Stockholm: The National Police Board. Rasmusson, M. (2013). Jakten på papperslösa intensifieras i Stockholm. Dagens Nyheter. [Online]. 30 January 2013. Available at https://www.dn.se/debatt/jakten-pa-papperslosa-intensifieras-i-stockholm/ [Accessed 12 April 2018]. Riksdagen (2006). Svar på skriftlig fråga 2006/07:528–Nya rutiner för utlänningskontroll. Stockholm: Rosenbad. Riksdagen (2013a) Interpellation 2012/13:290–Polisens prioritering av utvisningar. Stockholm: Rosenbad. Riksdagen (2013b) Aktuell debatt om den inre utlänningskontrollen och ID-kontroller i kollektivtrafiken. Stockholm: Rosenbad. Rikspolisstyrelsen (2011). Rikspolisstyrelsens föreskrifter och allmänna råd om Polisens inre utlänningskontroll. FAP 273-1. Swedish National Police Board. Rikspolisstyrelsen. 2013. Fakta om inre utlänningskontroller. Swedish National Police Board. [Online]. 22 February 2013. Available at: https://polisen.se/Stockholms_lan/Arkiv/Nyhetsarkiv/Gemensam/Polisens-arbete-med-inre-utlanningskontroller/ [Accessed 12 April 2018]. Roe, P. (2008) ‘Actor, Audience(s) and Emergency Measures: Securitization and the UK’s Decision to Invade Iraq’, Security Dialogue, 39(6), p. 615-636. Sahlström, M. (2013). Vi gör inga masskontroller. The Police. [Online]. 8 March 2013. Available at: https://polisen.se/Stockholms_lan/Arkiv/Nyhetsarkiv/Vastra-Gotaland/Vi-gor-inga-masskontroller/ [Accessed 12 April 2018]. Salter, M. B. (2008) ‘Securitization and Desecuritization: a dramaturgical analysis of the Canadian Air Transport Security Authority’, Journal of International Relations and Development, 11(4), p. 321-349. Sandin, O. (2014). Polisens mål: allt fler ska tvångsavvisas. Skånes Fria Tidning. [Online]. 14 February 2014. Available at: http://www.skanesfria.se/artikel/113411 [Accessed 12 April 2018]. Searle, J. R. (1969) Speech Acts: An Essay in the Philosophy of Language. Cambridge: Cambridge University Press. SOU. (2004). Gränskontrollag – effektivare gränskontroll. Stockholm: Edita Norstedts Tryckeri AB. Stark, L. (2012). Det enda de pratar om är rädslan för polisen. Re:public. [Online]. 17 December 2012. Available at: https://www.tidningenrepublic.se/reportage/det-enda-de-pratar-om-ar-radslan-for-polisen [Accessed 12 April 2018]. Stritzel, H. (2007) ‘Towards a theory of securitization: Copenhagen and beyond’, European Journal of International Relations, 13(3), p. 357-383. Stritzel, H. (2014( Security in Translation: Securitization Theory and the Localization of Threat. Basingstoke: Palgrave MacMillan. van Dijk TA (2000) ‘Ideologies, racism, discourse: Debates on immigration and ethnic issues’, in: ter Wal J. and Verkuyten, M. (eds. ), Comparative Perspectives on Racism: Research in Migration and Ethnic Relations. Aldershot: Ashgate, pp. 91-116.
van Muster, R. (2009) Securitizing Immigration: The Politics of Risk in the EU. Hampshire: Palgrave Macmillan. Vieira, M. A. (2007) ‘The Securitization of the HIV/AIDS Epidemic as a Norm’, Brazilian Political Science Review, 1(2), p. 137-181. Vultee, F. (2011) ‘Securitization as a media frame: what happens when media ‘speaks security’’, in Balzacq, T. (ed. ), Securitization Theory: How Security Problems Emerge and Dissolve. Abingdon: Routledge. pp. 77-93. Vuori, J. A. (2008) ‘Illocutionary Logic and Strands of Securitization: Applying the Theory of Securitization to the Study of Non-Democratic Political Orders’, European Journal of International Relations, 14(1), pp. 65-99. Wæver, O. (1995) ‘Securitization and Desecuritization’, in Lipschutz, R. D. (ed. ), On Security. New York: Columbia University Press. pp. 46–86. Wæver, O. (1999) ‘Securitizing Sectors? Reply to Eriksson’, Cooperation and Conflict, 34(3), pp. 334-340. Watson, S. D. (2009) The Securitization of Humanitarian Migration: Digging moats and sinking boats. London: Routledge. Williams, M. C. (2003) ‘Words, Images, Enemies: Securitization and International Politics’, International Studies Quarterly, 47(4), pp. 511-531. Williams, M. C. (2011) ‘The continuing evolution of securitization theory’, in Balzacq, T. (ed. ), Securitization Theory: How Security Problems Emerge and Dissolve. Abingdon: Routledge. pp. 212-223. Wittgenstein, L. (1958) Philosophical Investigations. New Jersey: Blackwell. As the discourse utilised by the Swedish government and the police use the terminology of ‘illegal immigration’, this is the language adopted henceforth in this article. Here, illegal immigration refers to people who either reside in Sweden without having applied for asylum or a residence permit, or people who have had their asylum request rejected but have not left the country. Acknowledging that ‘illegal immigration’ is not a neutral terminology referring to undocumented migrants, this terminology will still be used henceforth as it is the language employed in the Swedish context. Sectors (military-, political-, economic-, societal-, environmental-sector) for the CS, serve to identify specific kinds of interactions. Within each sector a variety of referent objects and threats can be identified (Buzan et al., 1998:7-8). Importantly, referent objects may reside in multiple sectors at once (Wæver 1999). Identifying different sectors promotes the CS’s claim that in theory, any issues can become securitised (C.A.S.E. 2006: 453). There are multiple ways in which an audience can accept a speech act. A securitising actor is sensitive to both formal and moral support. Although moral support is generally needed to a securtitisation to be succsessful, it is formal support by institutions that can sanction extraordinary measures to acctually be implemented (Balzacq 2005). For explanation regarding de-securitisation see for example (Buzan et al., 1998; Aradau 2004; Behnke 2006; Hansen 2001; Knudsen 2001).